Stuck inside? Looking for a fun and simple penguin craft? 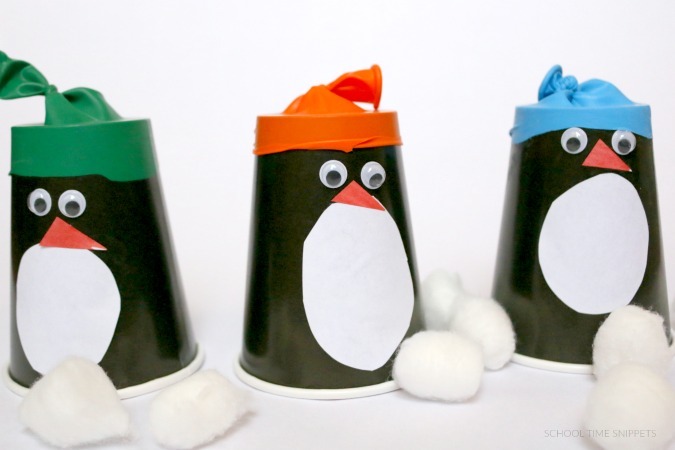 Then, make these DIY Paper cup penguins turned party poppers for some indoor winter fun! We all know the mantra, "Work hard, play hard." Well, I've got a super fun penguin craft the kiddos will love to put together once their school work is all done. 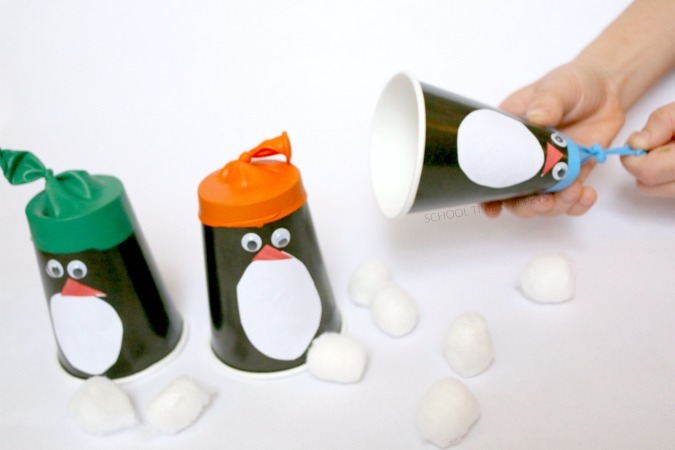 Reward a job well done and/or work done on time with these oh so adorable Penguin Poppers made from paper cups! 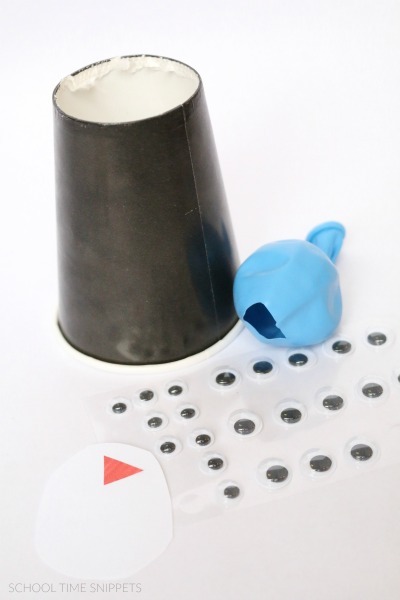 We all need a good laugh and a chance to burn energy through mindless play, and this paper cup penguin craft does just that! Given the supply list, adult supervision for the beginning of the project is highly recommended and/or prep the cup and balloons before the kiddos get near the activity. Please use your best judgment. Using a sharp knife, cut out the bottom of the cup. Next, tie the open end of the balloon into a knot. Cut across the balloon at the opposite end. Place the cut part of the balloon on the bottom end of the black cup. Then, apply sticky googly eyes and a small triangle cut from orange paper for the penguin's beak. Cut an oval out of white paper for the penguin's belly and apply with glue. Once your penguin popper is assembled, gather cotton balls or marshmallows. Place one or a couple in the open part of your penguin popper. To shoot the cotton balls or marshmallows out, pull the knot of the balloon back and let go to launch what is inside! Sneak in some learning with this penguin craft by using a ruler to see whose penguin popped the farthest! 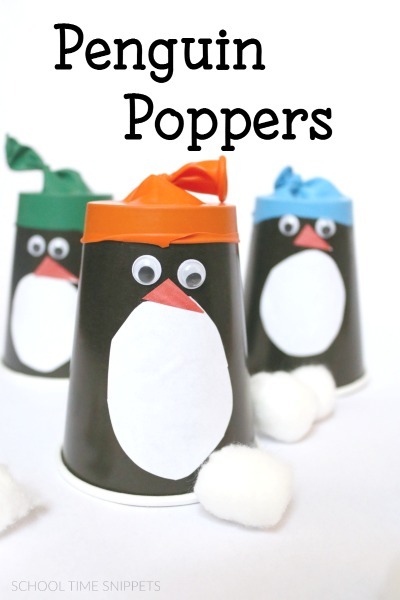 Have one person be the popper and have the another person try to catch the cotton balls and/or marshmallows with their paper cup penguin craft. Set an empty basket across the room and see who can pop the most items into the basket. For this, you may wish to use colored pop poms. We had some issues with the balloons sliding off, so as you hold the penguin popper, wrap your hand around the base of the balloon and pull the knot with your other hand to help keep it in place. Or you can attempt to apply a thin layer of glue or tape before putting on the balloon. Ah! These penguin poppers are just too cute! And so fun! So work hard, play hard people! Hope you and your kiddos have fun making them! If you are working on a penguin theme, you might like to check out our Penguin Math Printable that works on patterns. Browse through some printables we used for our own Penguin Theme a few years ago!